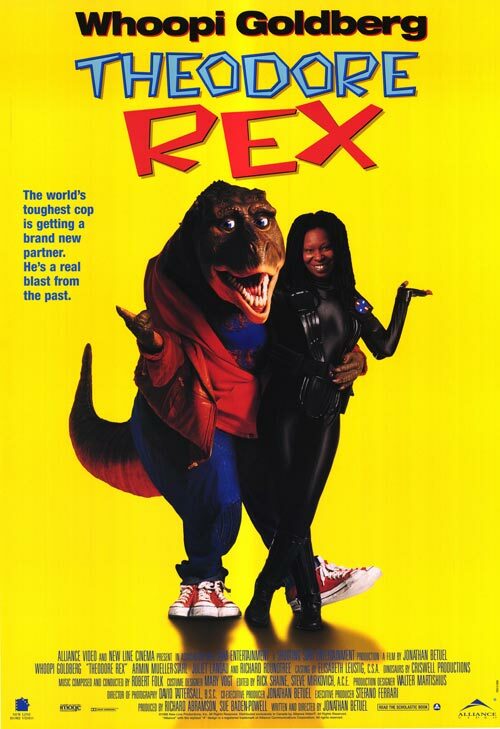 Today, I’m going back to my old stomping grounds of the IMDb Bottom 100 to cover a flick that has recently broken into its ranks: Theodore Rex. Theodore Rex was written, directed, and produced by Jonathan Betuel, who was also behind the films My Science Project and The Last Starfighter. The cinematography on Theodore Rex was provided by David Tattersall, who also shot the flicks Speed Racer, Next, The Green Mile, and Con Air, among many others. Theodore Rex featured two primary editors: Steve Mirkovich (Con Air, 16 Blocks, Big Trouble In Little China) and Rick Shaine (Pitch Black, A Nightmare On Elm Street). The music for Theodore Rex was composed by Robert Folk, who also provided scores for movies like Lawnmower Man 2, Wicked Stepmother, and Police Academy. The makeup effects work for Theodore Rex was done by the combination of Michael Burnett (Baby Geniuses, The Dentist), Jake Garber (Battlefield Earth, Ed), and Joseph Yuss Simon (Battlefield Earth, Escape From L.A.). The Theodore Rex special effects team included Marilee Canaga (Silent Hill, Dr. Doolittle 2), Thomas Dickens (Carnosaur, Army of Darkness), Mike Edmonson (DeepStar Six, Wild Wild West), Steve Fink (The League of Extraordinary Gentlemen, Men In Black), Patrick Gerrety (Red Planet, Con Air, Mortal Kombat), Doug Hudson (Happy Gilmore, White Chicks), Hans Metz (Mannequin, McBain), Darren Perks (Spawn, Leprechaun 4), William Stout (House, The Hitcher), and Joshua Pinney (Death Race, The Cell). The visual effects for the film were provided by Jesse Silver (The Core, Super Mario Bros, Highlander II), Thomas Thill (Volcano, Blade), Jongwoo Heo (Daredevil, Swordfish, Red Planet, Mortal Kombat), Robert Habros (Suburban Commando, Leviathan, SpaceCamp), and Allen Blaisdell (Red Planet, Anaconda). The cast for Theodore Rex is famously headlined by Whoopi Goldberg (Ghost, Sister Act, The Color Purple), and also includes Armin Mueller-Stahl (The Game), Juliet Landau (Ed Wood), George Newbern (Scandal), and Richard Roundtree (Shaft, Maniac Cop, Q). Theodore Rex takes place in an alternate universe where dinosaurs have been resurrected bu a team of scientists, and co-inhabit the Earth with humanity. After a dinosaur is mysteriously murdered (the first instance of such a crime), an investigation is launched that teams up a hard-nosed veteran cop with a rookie dinosaur new to the force. 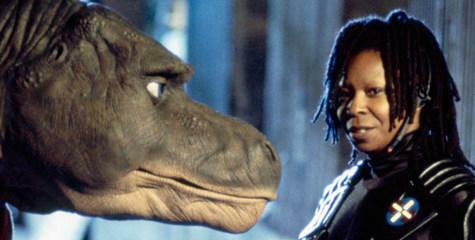 Reportedly, Whoopi Goldberg desperately wanted out of her role in Theodore Rex almost as soon as the production began, but wound up forced to complete the movie after a nasty lawsuit. However, she was ultimately paid an extra $2 million on top of her initially agreed cost to do the film. Theodore Rex was never released to theaters in the United States, as the distributors decided that the film wouldn’t be worth the cost of a theatrical release domestically. Because of this, it is widely regarded as the most expensive straight-to-video movie of all time. Theodore Rex himself, along with the other dinosaurs in the film, were portrayed with complicated puppetry, often requiring at least two operators per creature. Theodore Rex shockingly racked up only one Golden Raspberry nomination, specifically for Whoopi Goldberg as Worst Actress. However, it came out during a stacked year that also boasted the legendarily terrible movies The Island of Doctor Moreau and Striptease. Theodore Rex unsurprisingly received miserable reviews, and is well-remembered as a massive failure. It currently holds a 2.4 rating on IMDb (landing it in the site’s Bottom 100 listing) and has a 21% audience score on Rotten Tomatoes. One of the biggest issues with Theodore Rex is the Rex suit itself: it is distracting, the mouth movements are awful, and it has clear mobility issues that were clearly a hassle for all of the actors that had to work around it. At the same time, the cumbersome spectacle of the puppet suit may also be the only reason to actually watch this movie, or at least a few clips of it. 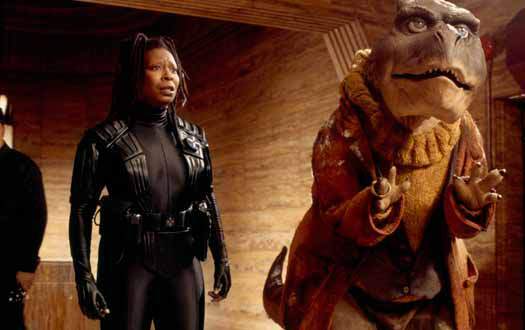 As you could probably deduce from the lawsuit and her outspoken disdain for the film, Whoopi clearly didn’t give her all in Theodore Rex. Interestingly, her attitude about the film in real life mirrors her character’s disdain for dinosaurs in the story, giving her performance an almost method sense of genuine emotion at times. For most of the duration, however, she is just garbage. The story of Theodore Rex contains a number of blatant parallels to real societal racial tensions that feel beyond unnecessary, particularly for a movie that is theoretically a family-oriented comedy. The entire movie becomes a little too dark as a result, which is further exacerbated by some of the noir-like aesthetics of the film. If the acting and effects weren’t enough, Theodore Rex is also a very slow-moving movie that takes its time to get through the loose plot framework. It felt to me like there wasn’t quite enough written story to fill out the film, and that comedic asides had to be injected to pad out the length. The obvious downside of this is that the supposedly comedic moments bring the motion of the story to an absolute stop, making the film seem longer than it is. I’m sure that this has been said before, but Theodore Rex looks and feels very much like Super Mario Bros. 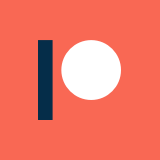 The dinosaur designs, the dark scenery and tone, and the weird juxtaposition of childlike antics with adult themes all pop up in very similar iterations in both productions. That is particularly astounding given that Super Mario Bros. released and very publicly failed just two years prior to Theodore Rex, begging the question of why the team chose to use such a similar aesthetic? Overall, Theodore Rex is a dull movie that lacked focus all the way back to its inception. There might have been a nugget of a good idea in the premise somewhere, but it never came to fruition. As I stated earlier, the spectacle of the massive, unwieldy dinosaur puppet is the only reason to sit through this movie, and that can really be satisfied by watching a handful of clips. If you ask me, this is a movie that you can skip without any regrets. Right after I finished the initial writing of this post, a fantastic piece on Theodore Rex released on /Film, which features in-depth interviews with the major players involved with the production and release of the movie. If you are interested in delving further into the trivia surrounding this colossal flop, definitely check it out.